Today I would like to share with you something that I have up-cycled into a very handy tool! 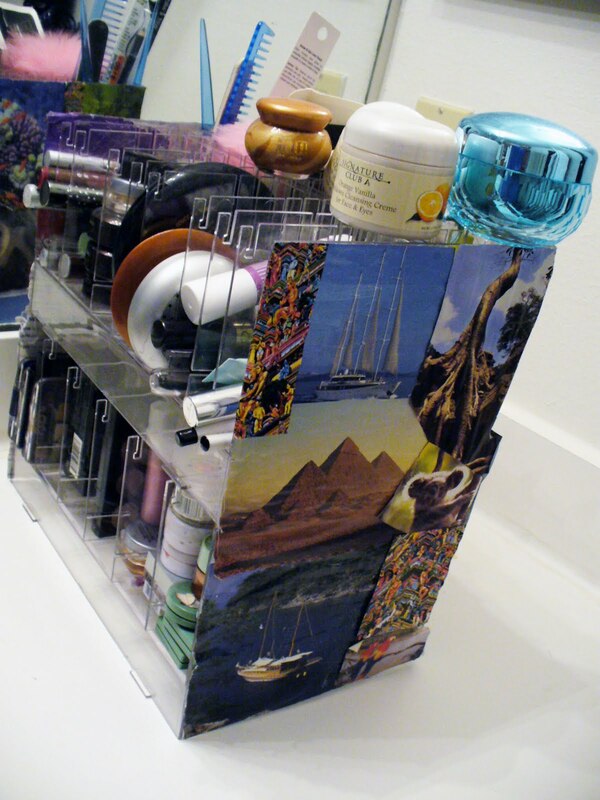 This is my new counter friendly, space saving make up and goodies holder! What do you think? Can you figure out what it is made from?! If you look closely it is actually an old make up rack used from a local Walgreens cosmetics wall. They were setting up their new cosmetics wall for the incoming season. They were tossing out TONS of these! I couldn’t resist, I just had to take some! 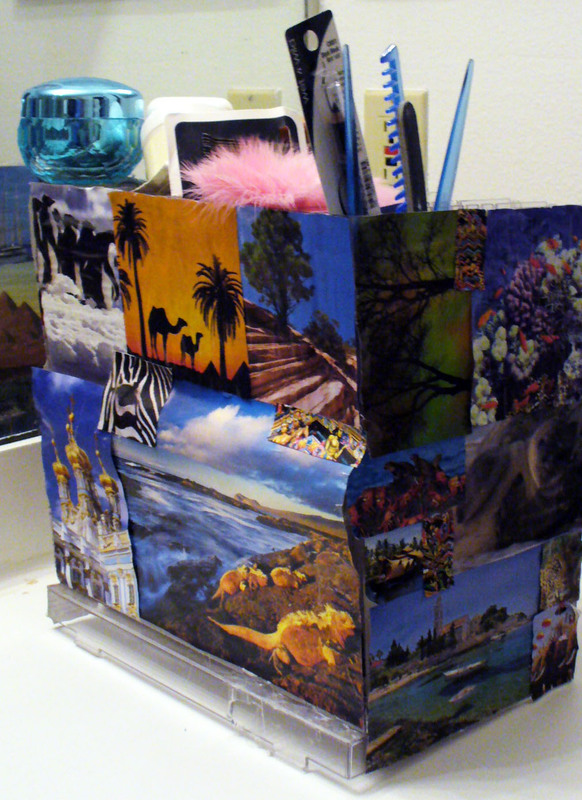 This is actually two mini racks that I hot glued together (obviously, I hot glue everything!) to make this awesome free standing shelf. 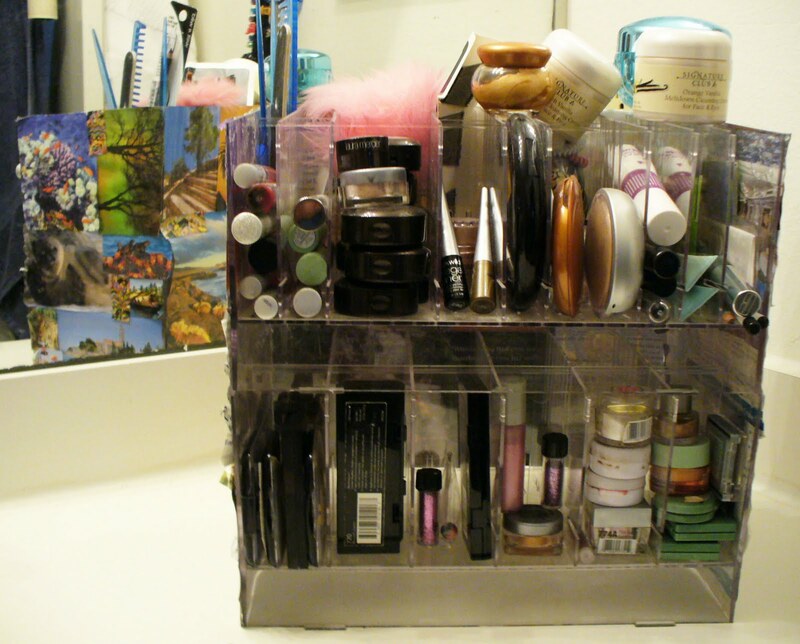 I LOVE that is has piles of little compartments, that I could easily rearrange as my makeup collection changes. These particular racks were some sort of acrylic or plastic that had withstood some discoloration from being under those display lights all the time, so I figured I should make use of all the clippings I saved of pretty shiny pictures BP. BP = Before Pinterest ! On a random tangent; apparently in one month I put up over 1500 pins according to an email I got from Pinterest! 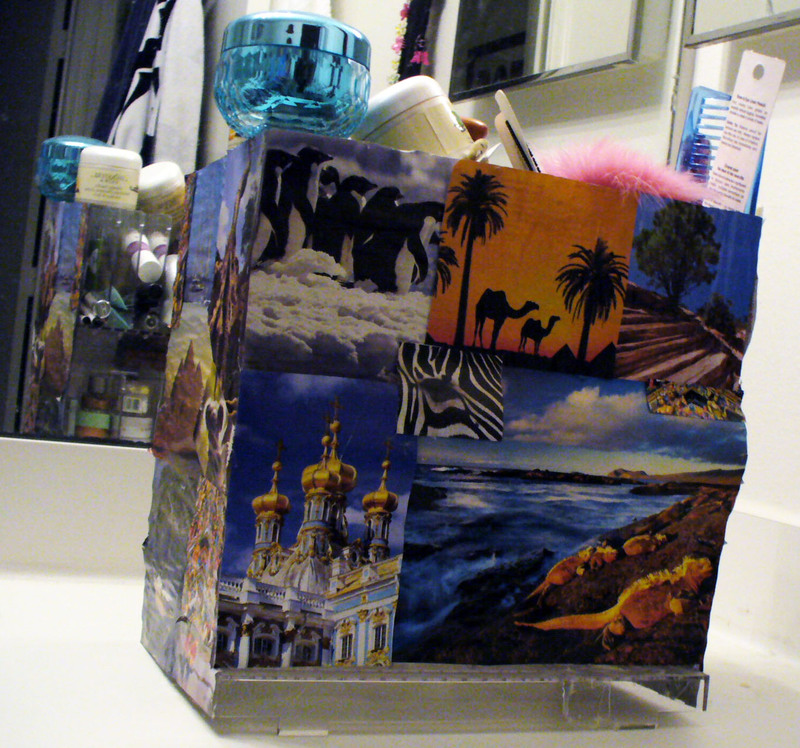 I am a Pinterest-aholic! If you haven’t checked out my Pinterest page you should, I have all sorts of sparkly things and DIY inspiration that could last you a life time! Anyways, back to this project. 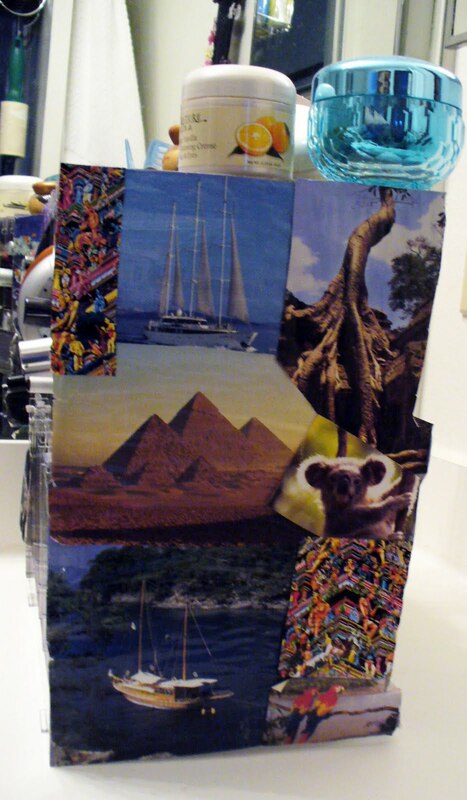 I pretty much covered all of the surface area on the exterior of my new rack in photos that I just loved, mostly from things like old National Geographic magazines and what not. I really wanted to keep them natural, and still colorful and vibrant to help inspire my mind while I’m trying to get ready. What is really awesome about this project (other than it was free!) is that the back portion of the rack is actually also storage. Because I stacked two different racks together, I can put brushes and longer items in the back, and they won’t fall all the way to the bottom, putting in even MORE storage options. Next time you are out and about and see these stacked by the side of the dumpsters, you’ll know what to do with them! Because they are made to assemble in stores, they actually break down pretty easy, and you can rearrange the mini spacers however you want. 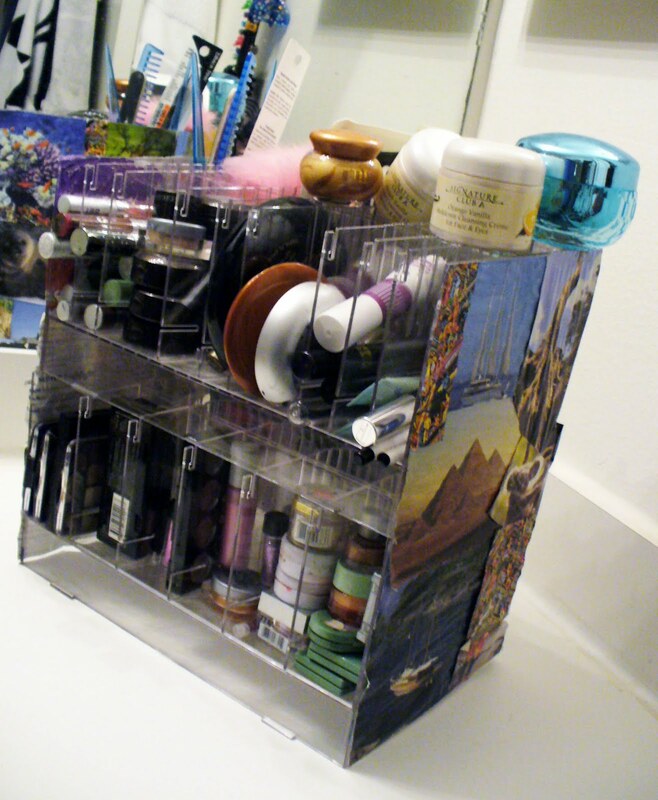 Just think of all the things you could organize with these! And to think they were just going to toss them! As Heidi Klum would say, Auf Wiedersehen!